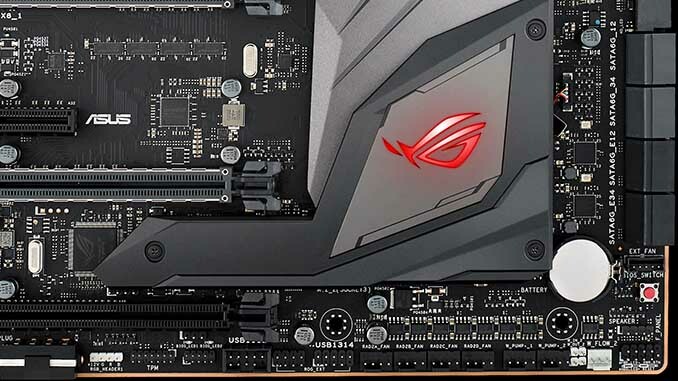 First unveiled at CES 2017, and launched by ASUS back in early March, the availability of the flagship Republic of Gamers (ROG) Z270 motherboard has thus far been limited to Newegg in North America. That changes today with the announcement that the Maximus IX Extreme is now widely available at leading resellers in both Canada and the United States. 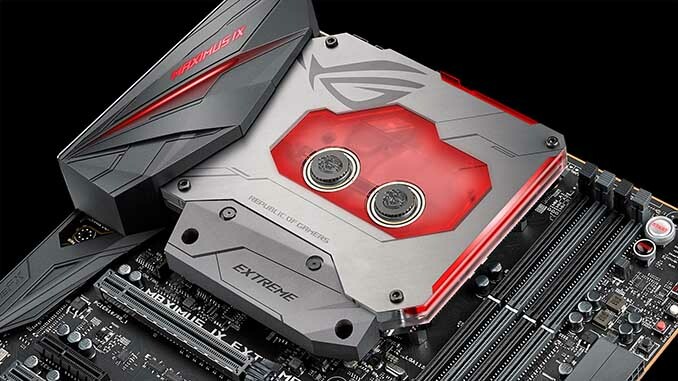 Built for gaming and liquid cooling enthusiasts, the Maximus IX Extreme represents the pinnacle of ASUS' engineering expertise. 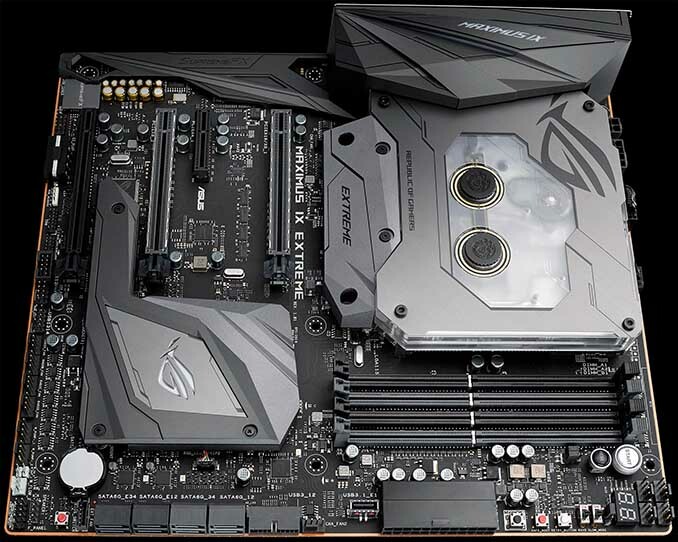 ASUS has also collaborated with Bitspower in order to develop the factory-installed monoblock water cooling solution that is clearly the model's most distinguishing feature over other motherboards. The monoblock is so large that it is likely the main factor behind this model's price. Designed to cool the CPU and the associated power delivery components, this monoblock incorporates flow rate, water leak, and inlet/outlet temperature sensors, all of which can be monitored and controlled from within the UEFI or the Fan Xpert IV utility. There is also ubiquitous RGB LED lighting built-in, which can be controlled by the AURA utility along with the LEDs integrated into the I/O cover, PCH heatsink, and any light strip attached to the 5050 RGB header. Speaking of headers, this motherboard has a lot of them. There are 12 fan headers, which includes 8 radiator fan headers and 2 water pump headers, and a number of additional flow rate and temperature sensor headers. Overall, this should not only negate the need for any additional fan controllers, but also reduce wiring complexity. All of these headers can be fully configured from within the UEFI or Fan Xpert IV utility. There is also a separate heatsink included to cool the topmost M.2 drive. While it is not part of the monoblock, it does make contact with it and thus should receive some level of passive cooling. Not to be ignored, the secondary M.2 drive can be cooled with the M.2 cover that is integrated into the PCH heatsink. Both of these M.2 connectors support SATA and PCI-E 3.0 x4 NVMe SSDs, as well as Intel Optane Memory, but only the secondary connector supports longer 22110-type drives. The remaining drive storage needs are handled by eight SATA 6Gb/s ports. In addition, the mainboard supports eight USB 3.0 ports (six rear, one header), four USB 2.0 ports (via two headers), one USB 3.1 type-A port, one USB 3.1 type-C port that supports Thunderbolt 3, and a rare USB 3.1 front-panel connector. Rounding out the connectivity is one gigabit LAN port powered by an Intel I219-V controller, onboard 2x2 802.11ac Wi-Fi with MU-MIMO that is based on Qualcomm Atheros QCA6174A chip, as well as HDMI 1.4 and DisplayPort 1.2 video outputs. Since this is a high-end gamer-oriented motherboard, it is no surprise to see ROG SupremeFX onboard audio. This 8-channel audio solution is designed around the Realtek ALC1220A codec, but also features a Texas Instruments RC4580 op-amp, ESS ES9023P digital-to-analog converter (DAC) for the front-panel output, shielded audio circuits, impedance sensing for the front and rear headphone outputs, and color-coded and LED-illuminated 3.5mm audio connectors. Given the pedigree of the Extreme model name, overclockers have not been overlooked either. 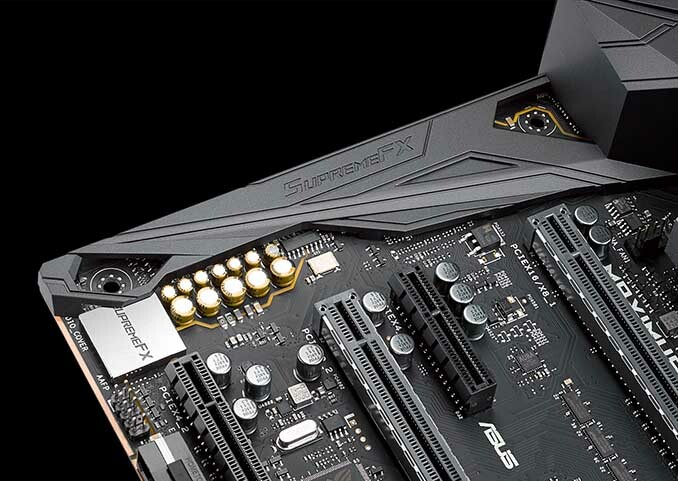 There is a plethora of ASUS-specific features that are designed with overclocking in mind, such as the ProbeIT voltage read points, Q_Code LED, an LN2 Mode jumper, a Slow Mode Switch, an RSVD switch, a ReTry button, a Safe Boot button, a MemOK! button, a DRAM channel jumper, and the ROG Extension connector. There are also diagnostic LEDs throughout the motherboard. Last but not least, the board features a standard complement of four DDR4 slots (which support overclocked memory speeds up to DDR4-4133), two strengthened PCIe x16 slots for graphics purposes (PCIe 3.0 x16 or x8/x8), one PCIe 3.0 x4 slot from the chipset, and one full length PCIe slot that operates at PCIe 3.0 x4. These last two slots get their bandwidth from the PCH, and there are SATA limitations that you need to research if you plan to use the mechanical PCIe x4 slot. 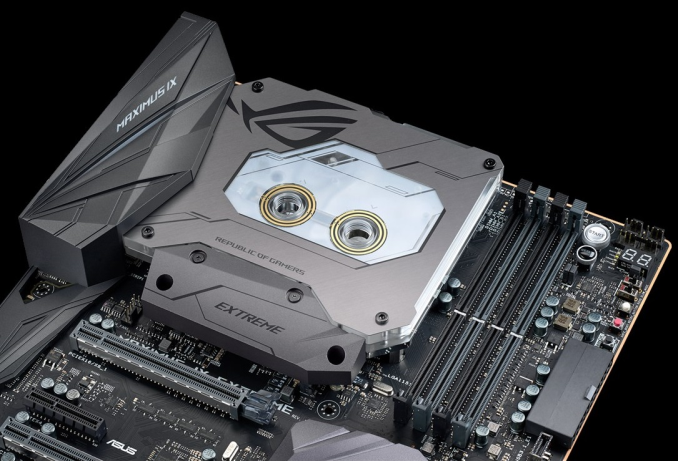 As mentioned in the introduction, the ASUS Maximus IX Extreme is now widely available in North America and carries a suggested MSRP of $629 USD. As a result of that price point, it supplants its predecessor, the Maximus VIII Extreme, as the most expensive LGA1151 motherboard on the market.